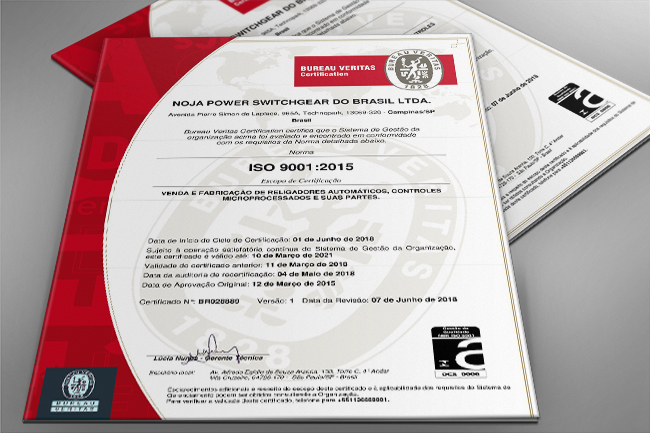 Campinas Brazil – NOJA Power Brazil today celebrates the recertification of accreditation to the ISO 9001 Quality standard, on this occasion achieving certification according to the 2015 edition of the standard. This certification verifies that the Brazilian manufacturing plant and organisation complies with the strict code of quality procedures and practices outlined by the International Standards Organisation (ISO). The award of the certification is the result of an independent audit of the firms’ systems and facilities, and demonstrates the commitment of NOJA Power Brazil to servicing the Distribution Switchgear Requirements of the Brazilian local market. Headquartered in Campinas Brazil, NOJA Power Brazil recently celebrated their facility expansion – a strategic investment in response to surging local demand. The key NOJA Power product, the OSM Recloser, is a device designed to improve Electricity distribution network reliability. Local demand for this product is increasing as Brazil invests in improving the local reliability of their energy supply. NOJA Power Brazil’s commitment to the ISO 9001 standard demonstrates how the firm is also investing in the reliability of their products, in strong support of the mission of local electricity utilities. "NOJA Power Brazil, aligned with our HQ in Australia, has always had a tremendous focus on product quality and customer satisfaction,” says NOJA Power Brazil Managing Director Bruno Kimura. “This has been demonstrated in practice by having our operation ISO 9001:2008 accredited right after the inception back in 2013. Now the ISO 9001 standard has been reviewed in its 2015 version and we sure wanted to have these improvements reflected in our everyday business so we reviewed our Quality Management System, went through third part audit and I´m please to say we have been approved." This key outline and scientific approach to quality within a company imparts a significant degree of confidence within customers, as their needs are set as the top priority focus.